Typical rain in the Philippines. Some of you might have noticed my recent lack of "blogtivity". The reason is simple - with my family, I traveled to the Philippines. Originally I planned to take a laptop with me however in a desire to travel lightly; my husband thought that an iPhone was sufficient. I found out later on that writing on a touch screen is ineffective for gardener's fingers like mine. Then I though that I could also post pictures knowing that they can speak louder than words...but sometimes life is not all that simple. Two of the three small cameras we brought stopped working when we got to Cagayan, the northern-most province of the Philippines. It was raining so hard that moisture must have penetrated the casing of the cameras. The only one that remained functional was the one that was stored it in a ziploc bag. The Philippines has a Tropical Marine climate as influenced by the sea. It is always hot with always high atmospheric humidity. There are only two climates namely wet and dry seasons. Although it is expected to rain every month, some months (June to November) are extremely rainy due to the monsoon winds. The rest of the months (December - May) are characterized by lower precipitation due to the dry trade winds. 1. The English word "boondocks," comes from the Tagalog word "bundok", meaning "mountain. 3. The Philippines was a colony of Spain for 300+ years (1521-1898). 4. The Filipinos were first introduced to the English language by the British invaders in 1762. 5. Today English language is taught in schools starting from third grade. It is the official medium of instruction in high school and college. 6. The Philippines has the same land area as Arizona. 7. The Philippines has a population of 91 million. 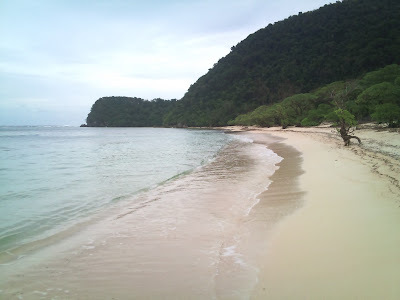 White sand in Santa Ana, Cagayan. and greetings to you all! Most plants that have experienced the summer find rest in autumn as they follow a common earth-tone color. Red, yellow, orange and brown are normal. Then there are those radical plants that seem to rebel against this trend. One unexpected colors of fall comes from the cyclamen flowers. Not only do they provide a fresh shift from the "dying or resting theme" of those plants that have gone through the rigors of summer, they also provide a renewed crisp life of the season. Since there are very few varieties of flowers in bloom, I had the luxury of observing this plant more closely than usual. The cyclamen flower starts in a droopy position with the end tip of the petals pointing downwards. The petals are folded in a very organized manner and twisted tightly together forming a beautiful pendant that gracefully hangs on the long pedicel. 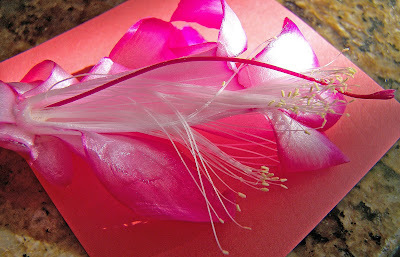 The petals turn upward, one at a time. 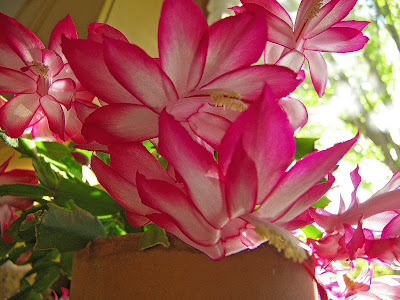 Flowers exhibiting this tendency are called "reflexed flowers". This phenomenon in directional growth of plant parts can be explained by a differential growth on the opposing surfaces any plant part. 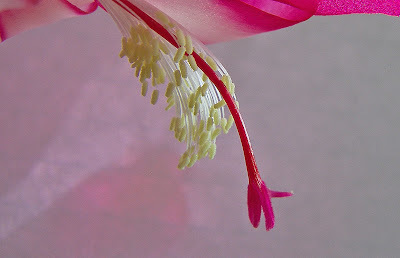 In the case of the cyclamen flowers, growths on the opposite surfaces of the petal are not the same. The inner surface undergoes a faster cell division or elongation than the other side. One petal turns upward at a time. 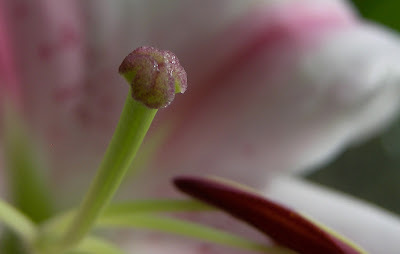 Flowers are designed in such a way that they contribute to the success of reproduction. 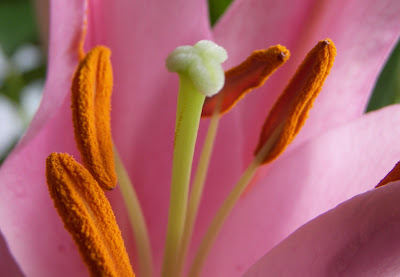 The reflexed petals may seem to make pollination easier than in other plant species since the style is clearly sticking out as seen in the above picture. 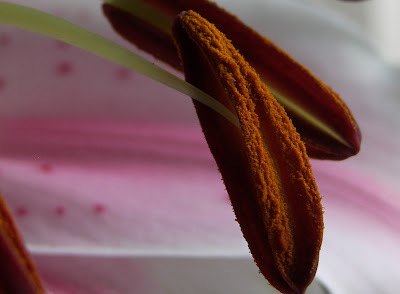 One would wonder why seeds rarely form from cyclamen flowers without human intervention. So I did a little bit of research and found a suitable explanation. There is an evidence that the stigma is inside instead of the outside the style (Reinchardt S., Ewald F., Hellwig F.). 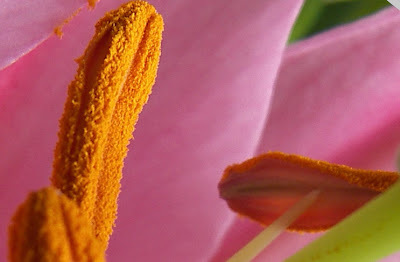 In normal flowers, the stigma is the sticky part of the flowers where pollen grains would stick to prior to its growth in the style during pollination. In cyclamen, it is reversed - the style was shown to have a terminal aperture which closes at some point during anthesis thus limiting pollination time. The chemical that controls this opening and closing of the style is not determined at the present. There's always something new to learn from the garden and cyclamen is indeed an interesting flower!